unless I Join this Co again. then I would not care, for If I leave the Office I would like to be busily engaged all the time. I am gitting along as well as could be expected have been alone for Several days, and was Sent to Athens last week on Business for Regt. Capt Gale is determind to quit the Service. I think it quite probable that his resignation will be accepted during this month he claims that he is unfit for duty on account of a wound received at Corinth. Co. D is stil at Burns Mills and are all well except Segrim McVey & Krieger. I have not heard from Segrim Since we left him in Puluski the 5" of March but suppose he is Stil in the Hospital. The Guirrillas are not troubling us as much now as they did at first. the Country is full of Scouting Parties and almost every day some of them bring in Some Reble Prisoners. 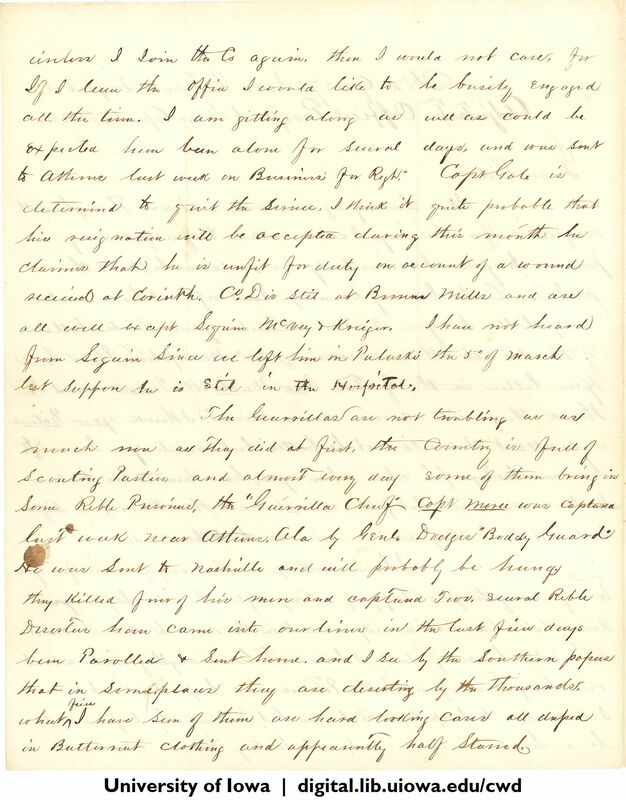 the "Guirrilla Chief" Capt Moree was Captured last week near Athens, Ala by Genl. Dodges "Boddy Guard". He was Sent to Nashville and will probably be hung. they Killed four of his men and captured Two. several Reble Deserters have come into our lines in the last fiew days been Parolled & Sent home. and I see by the Southern papers that in Some places they are deserting by the thousands. What fiew I have seen of them are hard looking Cases all draped in Butternut Clothing and appearently half Starved.